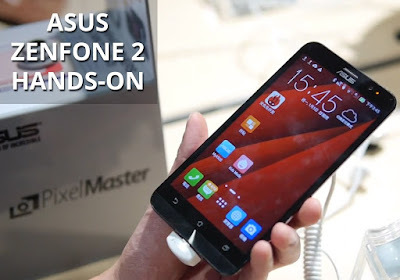 Asus had launched Zenfone 2 ZE551ML on March 2015, it comes with great features that you can check it in the below. 5.5-inch IPS capacity touchscreen with 1080p resolution and 403ppi density, Gorilla Glass 3 protection. Intel Atom Z3560 chipset with a 1.8GHz quad-core processor, PowerVR G6430 GPU. 2GB of RAM, 16GB of storage and a microSD slot for further expansion. LTE Cat.4, NFC, Bluetooth; GPS with A-GPS, GLONASS. Wi-Fi 802.11 a/b/g/n/ac, Wi-Fi Direct, Wi-Fi hotspot; microUSB 2.0 port, MHL, USB host. 13MP main camera with dual-LED dual-tone LED flash, 1080p@30fps video recording; 5MP front camera. 3,000mAh battery, fast charging to 60% in 40 minutes. Android 5.0 Lollipop out of the box with Asus ZenUI overlay. Nice build quality, sleek looking back cover. Non-removable battery despite the removable back cover. Zenfone 2 has a confusing naming convention - not only are there several of them, but ZE551ML comes in two hardware versions. This is the video which gives the best review of the mobile..